A 7.3 magnitude undersea earthquake, measuring 617 km, struck southeast Philippines on Tuesday. The quake comes five days after a smaller tremor in the same area. An earthquake with a magnitude of 7.3 that struck under the Celebes Sea off the southern Philippines was far too deep to cause any damage or to generate a tsunami according to seismologists. The US Tsunami Warning Centre has issued no warning, advisory, watch or threat after the quake in the Celebes Sea, which lies in the western Pacific between Sulawesi and the Philippines. Seismologists said it was too deep to cause any damage and casualties or a tsunami. The Philippines Institute of Volcanology and Seismology (Phivolcs) has, however, warned of aftershocks. Renato Solidum of Phivolcs said the quake was set off by the movement of oceanic plates 625 kilometers (387 miles) under the seabed. Solidum said the undersea quake was centered 223 kilometers (138 miles) southeast of Sulu province. A major earthquake measuring 7.2 struck off the coast of the island of Mindanao in the Philippines on Friday, raising the risk of tsunami waves as far away as Indonesia, the Pacific Tsunami Warning Center said. Hazardous waves could spread 300km (190 miles) away from the epicentre, which was in the sea south of the city of General Santos, the Center added. The U.S Geological Survey later downgraded the quake to 6.8. MISSOULA, Mont. - A 5.8 magnitude earthquake struck western Montana around 12:30 a.m. Thursday. The National Weather Service in Great Falls said on Twitter that the shaking was felt as far away as 500 miles (805 kilometers). The U.S. Geological Survey says the the 5.8 magnitude earthquake hit just after midnight about 6 miles (9.7 kilometers) southeast of Lincoln. The Lewis and Clark Sheriff's Office is reporting that power in Lincoln has been restored and there have been no reports of injury or damage in the area. Viewers around western Montana, including Missoula, Butte, Bozeman, Gardiner, Kalispell Columbia Falls, Hamilton and as far as Spokane, Washington, and Stirling, Alberta, Canada, tell us they felt the quake. We have received more than a thousand comments from viewers on our social media pages. A 76-year-old resident of Helena, which is about 34 miles away from the quake's epicenter, said it was the strongest seismic activity that he had ever felt. Ray Anderson said his wife told him the temblor woke up the dogs. Click here to learn how to stay prepared for an earthquake. The following earthquakes are the three of Montana's largest earthquakes in the last century. In August of 1959, a 7.5 quake killed 29 people and did $11 million worth of damage and became the largest earthquake to ever hit Montana. In 1935, a series of several hundred quakes hit Helena. The state reports that quake damaged more than half of Helena's buildings. In 2005, a 5.6 quake rattled Dillon and damages part of the old main hall at the Universtiy of Montana Western. The following is from the U.S. Geological Survey information on earthquakes. The following describes the typical effects of earthquakes of various magnitudes near the epicenter. The values are typical only. They should be taken with extreme caution, since intensity and thus ground effects depend not only on the magnitude, but also on the distance to the epicenter, the depth of an earthquake's focus beneath the epicenter, the location of the epicenter and geological conditions (certain terrains can amplify seismic signals). A 5.8 magnitude earthquake struck western Montana around 12:30 a.m. Thursday. The National Weather Service in Great Falls said on Twitter that the shaking was felt as far away as 500 miles (805 kilometers). The Lewis and Clark Sheriff's Office is reporting that power in Lincoln has been restored and there have been no reports of injury or damage in the area. Viewers around western Montana, including Missoula, Butte, Bozeman, Gardiner, Kalispell Columbia Falls, Hamilton and as far as Spokane, Washington, and Stirling, Alberta, Canada, tell us they felt the quake. We have received more than a thousand comments from viewers on our social media pages. A 76-year-old resident of Helena, which is about 34 miles away from the quake's epicenter, said it was the strongest seismic activity that he had ever felt. Ray Anderson said his wife told him the temblor woke up the dogs. The following is from the U.S. Geological Survey information on earthquakes. Events with magnitudes greater than 4.5 are strong enough to be recorded by a seismograph anywhere in the world, so long as its sensors are not located in the earthquake's shadow. 9.0 and greater At or near total destruction – severe damage or collapse to all buildings. Heavy damage and shaking extends to distant locations. 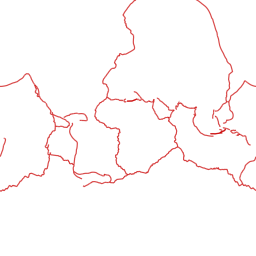 Permanent changes in ground topography. One per 10 to 50 years Based on U.S. Geological Survey documents. The United States Geological Survey said that a magnitude 8.1 quake hit about 73 miles off Tres Picos, Mexico, along Mexico's southern coast. President Enrique Pena Nieto said the earthquake is the biggest the country has seen in a century. He said that 62 aftershocks followed the quake and it's possible one as strong as 7.2 could hit in the next 24 hours. Chiapas' Gov. Manuel Velasco told Milenio TV that at least three people have been killed in the region and 10 died in Oazaca, close to the quake's epicenter. He said the quake damaged hospitals and schools. Two children also died in Tabasco state. One of them was killed when a wall collapsed, and the other was a baby who died in a children's hospital that lost electricity, cutting off the infant's ventilator. Smaller tsunami waves were observed on the coast or measured by ocean gauges in several other places. The center's forecast said Ecuador, El Salvador and Guatemala could see waves of a meter or less. "The house moved like chewing gum and the light and internet went out momentarily," said Rodrigo Soberanes, who lives near San Cristobal de las Casas in Chiapas, a poor largely indigenous state popular with tourists. "We have reports of some damage and the death of one person, even though we still don't have exact details," Morales said. He said the possible death occurred in San Marcos state near the border with Mexico. A rare and powerful 8.2-magnitude earthquake struck southern Mexico late Thursday, killing at least 32 people as seismologists warned of a tsunami of more than 10 feet. The quake hit offshore in the Pacific about 75 miles southwest of the town of Tres Picos in far southern Chiapas state, the US Geological Survey said, putting the magnitude at 8.1. Mexico's president said the earthquake magnitude was 8.2, the strongest in a century in the country. 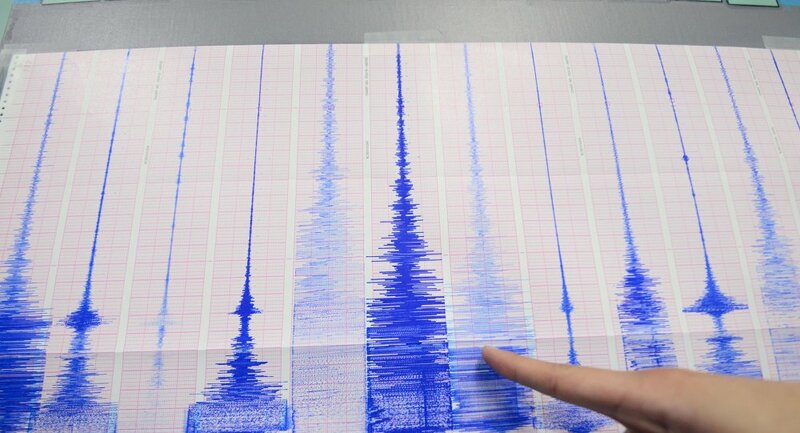 The country's seismologic service initially gave a magnitude of 8.4, which if confirmed would be the most powerful ever recorded in this quake-prone country. The quake shook a large swath of the country and was felt as far north as Mexico City - 600 miles from the quake epicenter - where people ran out of their homes in their pajamas as buildings trembled and swayed. A tsunami warning and the prospect of aftershocks kept the nation on alert. "Based on all available data ... widespread hazardous tsunami waves are forecast for some coasts," the Pacific Tsunami Warning Center said. The quake was felt in much of Guatemala, which borders Chiapas. President Enrique Pena Nieto ordered schools to remain closed Friday in Chiapas and Mexico City so officials could inspect for structural damage. He said on Twitter he was overseeing the emergency response from the National Disaster Prevention Center's headquarters. In Mexico City, people ran out of buildings after hearing earthquake warning sirens go off just before midnight (6am UK time Friday). The quake struck at a depth of 21 miles, the USGS said. It is the strongest to hit quake-prone Mexico at least since 1985, when an 8.1-magnitude earthquake in Mexico City killed more than 10,000 people. The authorities have since instituted a stricter building code and developed an earthquake alert system using sensors placed on the coasts. Mexico sits atop five tectonic plates, whose movement makes it one of the most earthquake-prone countries in the world. As Central America wakes up, some roads are proving to be impassable and buildings uninhabitable. Finally, Juchitán Oaxaca, where 17 people have died. This could be the image that comes to define the earthquake in Mexico. In Oaxaca, the State Governor Alejandro Murat has given more details about the deaths in his state. He said that 17 people died in Juchitán, where the photo of the Mexican flag in the pile of rubble was taken. Other people died in Ixtaltepec, Miltepec, Xadani and Huamelula, putting the number of people killed by the earthquake in his state at 23. In Chiapas, The Secretary for Civil Protection said that seven people had died. Luis M anuel García Moreno said that three people died in San Cristóbal, two in Villaflores and one in each of Pijijiapan and Jiquipilas." It has been confirmed that two people have also died in Tabasco. This brings the overall number of deaths to 32. 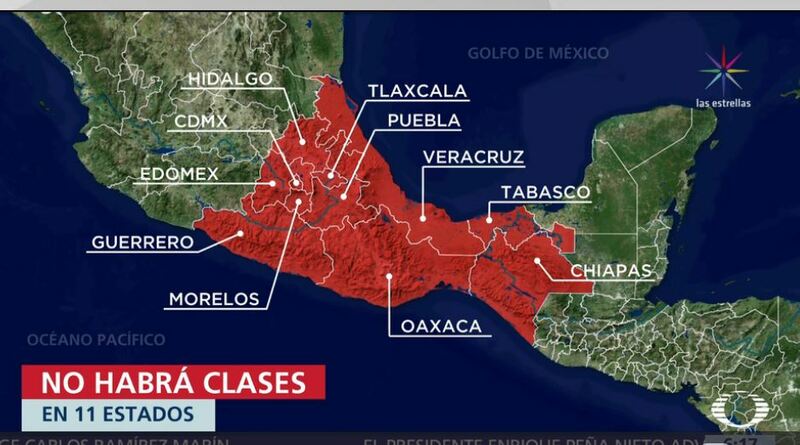 Schools have been shut across most of Southern Mexico today, with inspectors checking the damage on buildings. To gain a sense of scale, this is what those closures look like. This earthquake has spread across thousands of miles and earlier, the President, Enrique Pena Nieto said that 50 million people had felt tremors. The last major earthquake to hit Mexico City was 1985, when scores of buildings collapsed killing at least 10,000 people. Since then, there has been a serious shift in attitude towards combating natural disasters, and earthquake sirens have been placed around the city. This early warning system went off minutes before the ground shook and allowed people to leave their homes before the danger hit. Like the Galapagos, Guatemala has lifted its tsunami warning. INSIVUMEH, which is the National Institute for Seismology, Volcanology, Meteorology and hydrology issued the notice. Dozens of people in Guatemala have been affected by the earthquake off their Western coast, but there has not been any reported loss of life. Several buildings have been severely damaged along the coastline, but there is now no threat of a tsunami. In Honduras, a green alert has been issued, which means that they are monitoring the situation closely. Alejandro Murat, the Governor of Oaxaca has said that 20 people have died in his state. This brings the overall total to 26 after four people died in Chiapas and two more were killed in Tabasco. and swayed across the skyline of one of the world’s biggest cities. Update 9 (9:10 pm ET): The head of Mexico's National Civil Defense agency says the death toll from a major earthquake that rattled the center of the country has reached 139. Luis Felipe Puente said 64 people had died in the state of Morelos, just south of Mexico City, though local officials reported only 54. In addition, 36 people died in Mexico City, 29 in Puebla state, nine in the State of Mexico and one in Guerrero. Update 8 (7:15 pm ET): Death toll from Mexico earthquake now at 119, according to state and city officials. That makes it the deadliest to hit the country since the 1985 quake that, in an incredible coincidence, occurred exactly 32 years ago today, surpassing the death toll from another earthquake the shook the region less than two weeks ago. Update 7 (6:50 pm ET): Mexico City government says 30 dead in capital, bringing nationwide total to 94, according to AP. Mexico City Mayor Miguel Angel Mancera said that the number of buildings that collapsed has risen to 44, and that between 50 and 60 people have been pulled alive from rubble. Horrifying videos of buildings crumbling into piles of rubble continue to emerge on Twitter. Journalists in Mexico City are sharing reports of ordinary citizens rushing to pull people from the rubble. Here's more from the AP. Carlos Mendoza was standing just blocks away when an apartment building collapsed in Mexico City's trendy Roma neighborhood. The 30-year-old joined the rescue efforts and said he has been able to pull two people alive from the rubble in three hours of work. "When we saw this we came to help. This is ugly, very ugly," he said, covered in dust. Also in Roma, Alma Gonzalez was in her fourth floor apartment when the quake collapsed the ground floor of her building, leaving her no way out. She was terrified until the people living in the neighboring house mounted a ladder on their roof and helped her slide out a side window. "They helped us leave with a ladder," Gonzalez said. "I think my father the Lord who has us here for some reason." Buildings also collapsed across the neighborhoods of Condesa, another fashionable district in the city constructed atop soft soil and extremely vulnerable to earthquakes. Outside, thousands and thousands stood in the streets, avenues and sidewalks, filling the popular neighborhoods with a sense of dread. On Laredo Street, an entire eight-story apartment building had fallen into the road, leaving an enormous heap of concrete and rubble pouring into the street. At least 100 people stood atop the pile clearing it by hand, piece by piece, passing boulders and twisted steel pipes along a human chain that radiated from the heap like spokes. Update 6 (6:30 pm ET): More than 3.8 million Mexicans are without power after today's quake, while the death toll climbs to 79, according to the AP. Here's a particularly harrowing video of what looks like an old warehouse collapsing like a house of cards during the earthqake. A large earthquake warning is in effect for the next several days for international locations in addition to what is going on in California. 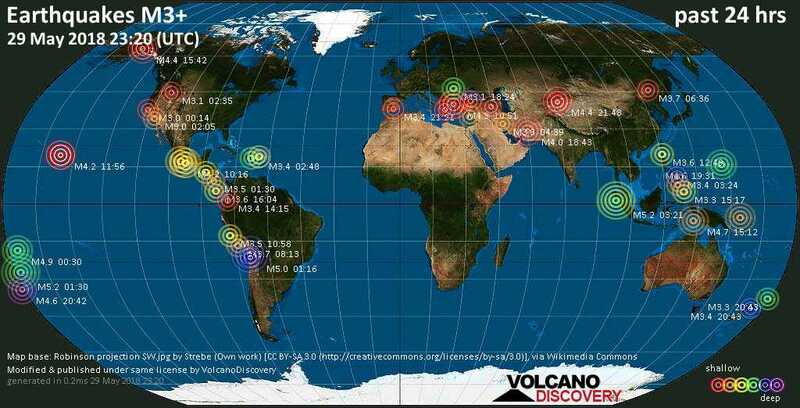 The West coast of the United States has seen a noteworthy increase in seismic activity over the past 24 hours. Particularly, a noticeable earthquake event began in the past day across Central + Southern California. Multiple M4.0 range earthquakes struck next to TWO sets of offshore oil / gas pumping rigs in two separate California coastal locations. This comes on top of the news that a slow slip event is now taking place in Southern California near Anza Gap, which is located Northwest of Salton Sea and Southeast of Los Angeles. Something BIG is rising up from earth beneath New England - Seismic anomaly reveals! 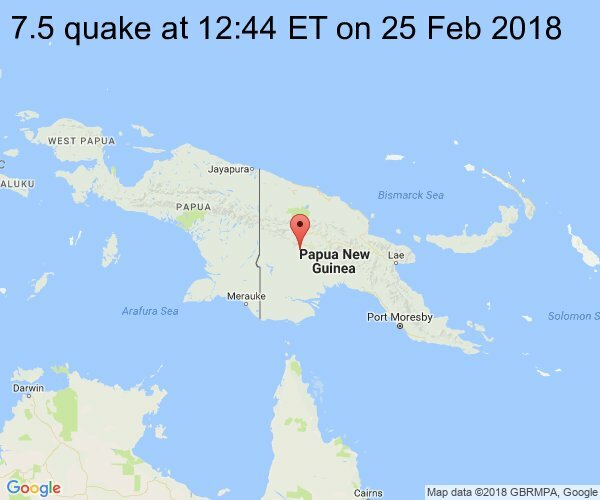 Papua New Guinea on February 25th 2018 at 12:44 pm ET. A 7.5-magnitude earthquake occurred in the waters off Papua New Guinea, the US Geological Survey (USGS) said. No information on victims or destruction has appeared so far. According to the preliminary information, no tsunami warning was issued for Papua New Guinea as well as there is no threat to Hawaii. Papua New Guinea is a part of the so-called "Ring of Fire" — a string of volcanoes encircling the Pacific Ocean. It is a seismically active zone and thus it regularly suffers from earthquakes. Lower Puna resident Ikaika Marzo told the Honolulu Star Advertiser that he saw 'fountains of lava' shooting 150 feet in the air and molten lava spreading down Mohala Street in Leilani Estates. Winds are set to shift on Monday and Tuesday, causing higher concentrations of ash and volcanic smog - ‘vog’ - that will spread west and northwest to affect more populated areas, Bravender said. U.S. Marine Corps and National Guard helicopters are on standby for an air evacuation near Highway 130, the last exit route for coastal residents. HONOLULU (KHON2) - The Pacific Tsunami Warning Center reports the earthquake that occurred at approximately 5:39 p.m. was NOT large enough to cause a tsunami for the Island of Hawaii. Preliminary data from the U.S. Geological Survey indicates that the earthquake measuring a magnitude of 4.1 was centered nearly five miles south of Volcano, in the Hilina region of Kilauea.